Welcome to our new season. We are excited about our planned productions this year. We’re offering a wide selection of plays, some of which are new to the amateur stage, and some which we know are already firm favourites with audiences. 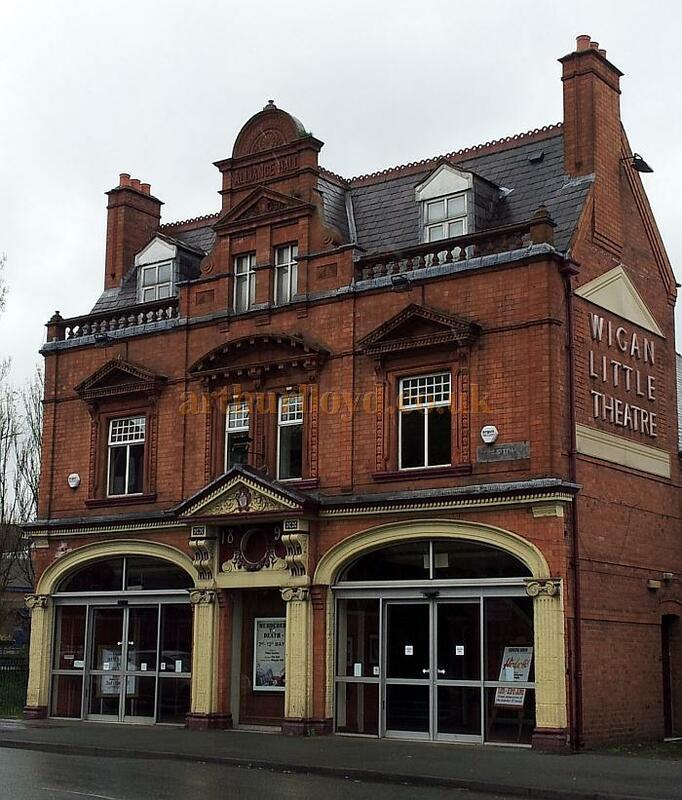 Wigan Little Theatre has been the byword for entertainment in the town over 70 years, but never rests on its laurels. We always strive to offer our patrons a great night out. Last season we were delighted to open our new bar ‘Next Door’ which also provides many more toilets and has enabled us to be a fully accessible venue, adding value to your theatre experience. All of our successes and developments are due to the hard work of our volunteers, whether on stage, behind scenes or front of house. The talent and skills that they bring to our season is mind-boggling and the hours put in are too many to mention. But as they say, volunteers are not unpaid because they’re worthless, but because they are priceless. In the autumn of 1943 a small group of enthusiasts gathered to discuss the possibility of forming a drama group. This became a reality when the first headquarters was found at 56a Market Street for what was to become a very successful amateur drama society. Plays were rehearsed and sets made and then performed in a local church hall, three plays per year until the end of the 2nd World War. At the end of hostilities Wigan Little Theatre, as the group became known, searched for a permanent home. This was found in a derelict cinema; the Alliance Picture House, also known as Canada Pictures, in Crompton Street, formerly the Alliance Hall which was built in 1893 as a Salvation Army citadel. Right - The Little Theatre, Wigan in 1957 - Courtesy George Richmond. In austerity Britain it was a condition of the building licence for its conversion that as many jobs as could be done by amateur labour should be, for labour was bound by priority and materials by finicky regulations in the national cause. The post-war reconstruction was one of the Theatres finest hours. Expert advice, duly delegated to eager members from various walks of life, directed the stripping of plaster and pickaxing of underground passageways each evening, while by day the joiners and plasterers spread their masking finishes. The Cinema had been reached by a central passage between semi-detached shops with accommodation over. The dividing party wall between the two was demolished to provide a long basement under what had been the shops; a foyer was constructed from what had been the shop floors and the former passage to the cinema. On the floor above, from what had been the first floor domestic accommodation, a coffee lounge and balcony crush hall was formed. On the floor above, two small rooms became the wardrobe department, (one of these later became a members bar before a full licence was granted to the Theatre). A passage was created from the long basement at the front of the Theatre under the auditorium to lead to the two large dressing rooms and green room under the stage. At the same time a storage area for furniture and props was created. Both alterations involved the removal of a great deal of rubble and earth by the volunteer labour. After this, concrete floors were laid in the new passage and what became known as the hold. Public lavatories were created in the former shop basements together with a small kitchen. Lavatories and washing facilities were made for the actors under the stage. The heating system reused the old coke furnace, the central heating pipes and radiators being adjusted as required. The stage itself was extended out into the auditorium to make a stage depth of twenty feet, with a plastered cyclorama on the back wall and a covered cyclorama pit. The proscenium width is thirty feet, with a height of fifteen feet, wing space being minimal at about four feet downstage right and left, a little more when extended over the staircase wells and fire exits upstage right and left. Adequate space was created above the stage for lighting barrels, curtain tracks, and borders, by removing the plaster ceiling and exposing the loft area. Left - A photograph of an early Little Theatre production - Courtesy George Richmond whose in-laws were in the show. Contrary to conventional practice the Stage manager was located stage left, and prompt; stage right, the get in doors, being located downstage right, would have interfered with the lines and cleats had the conventional arrangement been adopted. The extension of the stage into the auditorium resulted in a seating capacity of 250. The former projection box located behind the back wall of the balcony and being the full width of the building was converted into lighting and sound gallery, the Strand lighting consul and sound desk being of a professional standard, with space for follow spots and projection equipment. Scene storage was under the auditorium, the flats being brought up onto the stage through trap doors in the stage floor. These traps could also be used during a production. The money for the above was raised through members fund raising and interest free loans from generous member benefactors. In all the deposit on the building and the alterations amounted to £3500, and shortly after the Theatre opened another large interest free loan of £4000, put the Theatre on a sound footing. 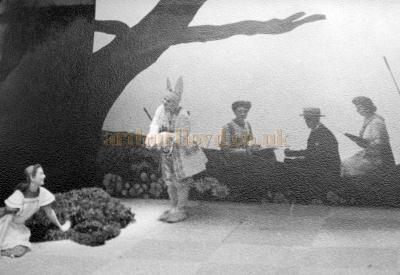 Right - A photograph of an early Little Theatre production - Courtesy George Richmond whose in-laws were in the show. 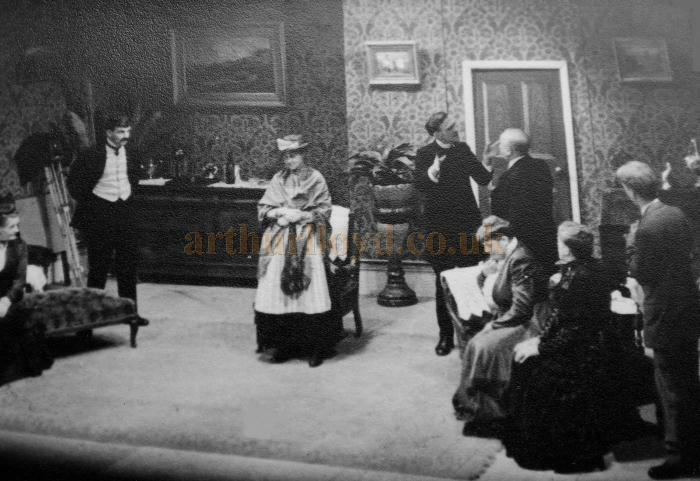 The first production in the 1947/48 season of the new Theatre starting on Wednesday March 10th for ten nights was 'She Stoops to Conquer' by Oliver Goldsmith. Thereafter between seven and nine shows were presented per season. The development of the building continues. The lighting and sound equipment have been regularly updated. The heating system now uses a modern gas boiler. In the 1970s a new workshop/scene dock was built stage right attached to the Get In. At the same time below this, a new bar / rehearsal space was created. In the mid 1980s a major reconstruction of the building was undertaken. The front of house and the basement were remodelled, the basement being converted for use as a bar. The auditorium was re-seated, the dressing rooms and facilities remodelled and the entire building redecorated at the cost of a quarter of a million pounds, the money coming from fund raising and grants. In the 2000s new rehearsal space has been created at the rear of the building eliminating the need to hire rehearsal space when at times as many as three productions can be in rehearsal. 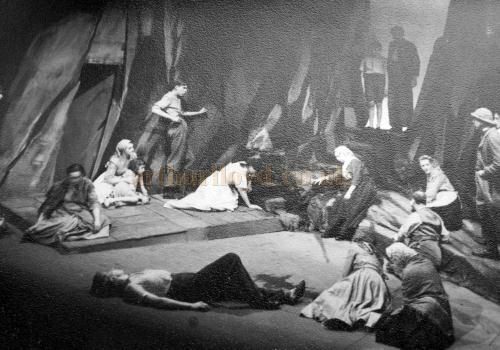 Above - A photograph of an early Little Theatre production - Courtesy George Richmond whose in-laws were in the show. The above article has been only concerned with the Wigan Little Theatre building itself. It is the members, both past and present and the productions that have been presented by them over the past 65 years and counting, that makes for the continued success of the Theatre, keeping live entertainment available to the theatregoers of Wigan and the surrounding towns. New members are always given a warm welcome, and the Theatre's own website is very comprehensive and can be found here. 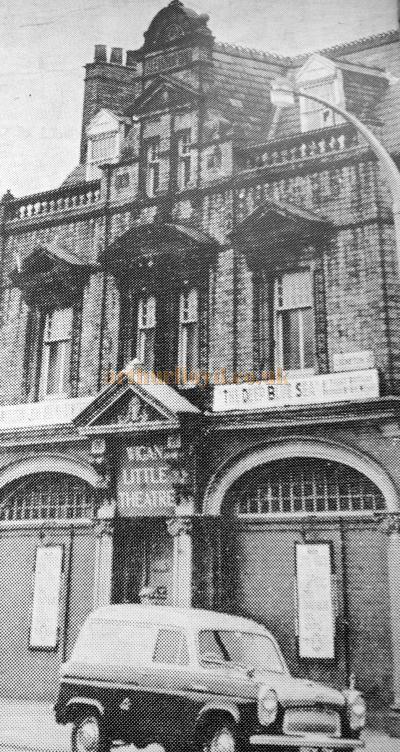 This article on the LittleTheatre, Wigan, was written and kindly sent in for inclusion on this site by George Richmond in 2012. The article is © copyright George Richmond 2012.